Introducing a quick, easy and fun way to potty train. Potty Partnership brings your child into the process as a true partner, tailored to his or her unique personality and how they learn. Based on research and observation of personality types in young children, we’ve developed five potty training personalities. Which potty personality sounds most like your child? The key to potty training these scampering Squirrels is to help them focus. They’ll need constant interaction, whether it’s keeping them company in the bathroom or conducting a game to keep them interested. Squirrels are hyper, and making sure they have enough play time to burn off some energy will help them settle down to try the potty. Want to learn more about your Squirrel? Ditch the diapers, introduce your Squirrel to Pull-Ups® and start training together. Shy. Nervous. Resistant to change. Turtles are interested in potty training, but they’re suspicious of the process because it’s something new — and they aren’t so eager to try it out. They also have a will of steel; they’re persistent and insistent on doing things their own way. Want to learn more about your Turtle? Ditch the diapers, introduce your Turtle to Pull-Ups® and start training together. Owls have a lot of strengths that fit nicely into the potty learning journey, and often are potty trained fairly early on the age spectrum. In the first part of potty training, an Owl needs to know the rules – she wants to do everything right. Owls will follow your directions, so give them clearly and in order. Owls are known to concentrate well when they understand what’s expected and have some guidance. Want to learn more about your Owl? Ditch the diapers, introduce your Owl to Pull-Ups® and start training together. As long as the potty training journey is fun, Bear Cubs will be willing. When their interest wanders, however, Bear Cubs can be easily distracted. They don’t notice — or care — if they have a full diaper, and are unlikely to pipe up if they need a change. Your Bear Cub is curious about potty training, but he might be more interested in dropping pennies into the potty than pooping into it. Want to learn more about your Bear Cub? 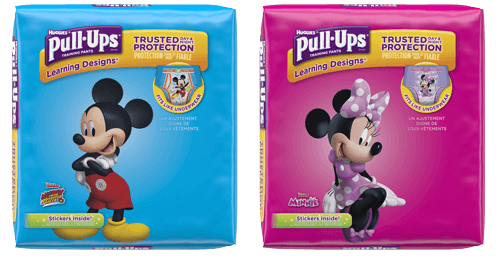 Ditch the diapers, introduce your Bear Cub to Pull-Ups® and start training together. Ready. Willing. Eager to please. Puppy personalities have lots of energy, and are pretty easy to direct. They're loving, enthusiastic, and only irritable when hungry, tired or sick. Your Puppy is generally happy, pleasant and ready to go. These characteristics will translate to potty training. She notices when her diaper is full, but she is not necessarily bothered by the feeling of it. Puppies may or may not tell you when they've pooped, but overall they are interested in the potty. Want to learn more about your Puppy? Ditch the diapers, introduce your Puppy to Pull-Ups® and start training together.